This introduction refers to the fourth of our Four Essential Features of the freestyle stroke. The human body is designed to use rotational force for so many movements: walking, running, throwing, kicking, punching, rolling, and swimming too. The spine creates an axis from top to bottom which the mass of the torso can rotate around. The rotating mass of the torso, with appendages swinging off of that torso can generate a lot of force in a rhythmic manner, which increases efficiency and endurance of movement. The rotation of the torso creates the wave of force and then sends that wave down one of the appendages to reach the point where it can do some work (like kicking a ball, or swinging the leg forward in running). The appendage receives and directs the force more than it generates force on its own. This is important, because the big torso has big muscles which can work a long time while the appendages have relatively smaller muscles which can work less time. So having the appendages primarily receive is better than having them work independent of the torso rotation. Ideally in swimming freestyle, you will use the torso rotation to empower both the entry and extending lead arm as well as the catch and pull on the other side of the body. In order for the single torso rotation to empower both of those, those two actions need to happen at the same time, while the torso is turning. The problem is that humans are not natural swimmers and the body is not shaped ideally for it. The land-mammal instinct in water is to pull and push with the appendages and not use the rotation power of the torso rotation in a coordinated way. This instinct almost always disconnects the catch and pull arm from the torso rotation, and because of this humans, even many elite swimmers, tend to be shoulder-powered swimmers more than torso powered. Why? The torso rotation will always wait for the entry arm, because it holding that arm above the surface of the water. The untrained human swimmer will impatiently pull with the lead arm before the torso is ready to rotate (because its still waiting for the recovery arm to come forward! ), and so this swimmer has to pull against the water using the smaller, more quickly tiring shoulder muscles and not the bigger, relatively tireless torso muscles. 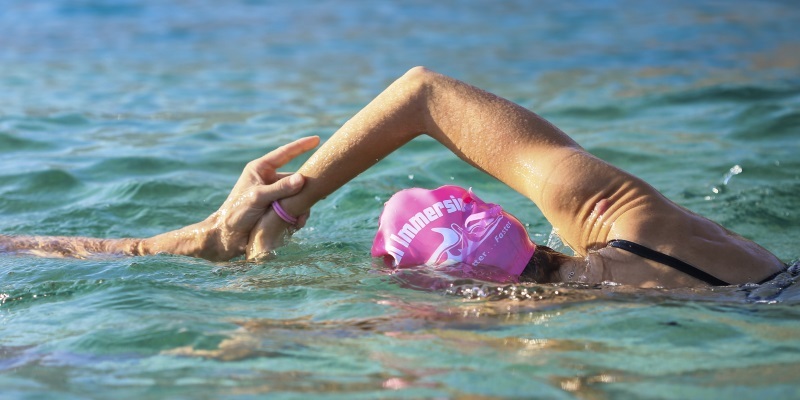 It is possible to swim fast and far without using the torso rotation to empower the catch and pull, but it is very tiring, and greatly increases the risk of shoulder injuries. The lead arm must wait (rather, it must keep extending forward) until the recovery arm has come all the way forward into entry position. Only then can the two sides be empowered by the torso rotation. There is a little room for adjustment on this depending on how fast and intense you are swimming – it could be slightly sooner or slightly later – but this is approximately where the arms need to be when the torso starts to rotate. If you pull too soon, then the shoulder muscles are taking the entire load and once moving through the pull, cannot transfer to the torso rotation. In most untrained swimmers, most of the pull will be finished before the torso even starts rotating. If you pull too late (as if coming back into Superman Position before setting the catch), then the torso has done most of its rotation and not much is left for the catch/pull to tap into. Most untrained swimmers fall into the former category. Some swimmers who learn the importance of this timing end up exaggerating it and falling into the latter category. Both need to be brought closer to the optimal arm switch timing. The torso-rotation-empowered stroke requires what is called ‘Asymmetric Stroke Timing’ or in other words, overlapping the arms in front of the head before they switch. This is also generally known as ‘front-quadrant swimming’ but that is a vague term which can mean different things to different swimmers. 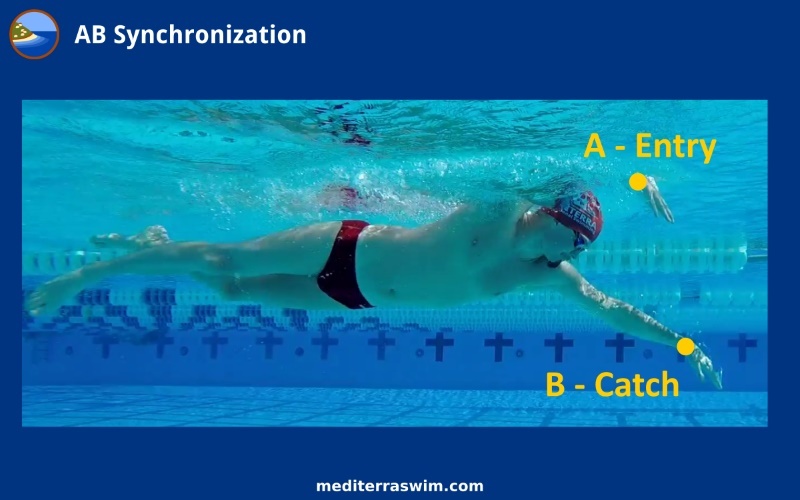 It does not come naturally, but once the swimmer takes the time to train this into the stroke choreography it opens up a great deal more control over energy and pace. Once you can control the switch timing of the arms, you can begin to control your stroke length, which is the foundation of building speed. You may view this video to see the optimal arm switch timing applied to this stroke at 1.03 second tempo. Without focusing on it directly, the drills for the Recovery Swing also set up the critical timing of the arm switch. As you were doing in the drills, your Skate side of the body remain long, firm, and the lead arm should continue extending forward, until the recovery hand arrives at the entry position. This is the best switch moment. Switch a little too early or a little too late and you lose the effect. You may notice the feeling of acceleration on each stroke when you shaped the entry and timed the arm switch like this. This is exactly the magic we are looking for as these pieces come together! Memorize this entry position and timing (in the picture above). This is where your recovery arm should be when you set the catch on the lead arm. That lead arm needs to learn to keep extending forward until the other arm reaches this position. This will get you very close to tapping into the longer lasting muscles of the torso. However, just because the arms are timing with the torso rotation does not mean they are tapping into that muscle power as much as they could be. Deeper perception of fine timing and muscle activation is required. During the lesson we will look for this connection and help you begin to feel it. Yet, this touches on advanced skills and we spend a lot more time on this in our advanced training in Synchronized Propulsion, and in our online course Master Class Synchronization.